Physical fitness promotes health. For one person it may be walking, for another jogging, bicycling or dancing. Increase the joy and pleasure of movement. In most cases about 20 minutes of continued activity is enough to keep in shape and regenerate. When the urge to watch TV or just to crash occurs, do some of the movement—you will gain energy. The exercises this article are are developed to reduce discomfort, increase flexibility and improve health. Practice them throughout the day, especially before the signals of pain or discomfort occur. First read over the General Concepts Underlying the Exercises and then explore the various practices. While practicing the strength and stretch exercises, always remember to breathe. Exercises should be performed slowly, gently and playfully. If pain or discomfort occurs, STOP. Please consult your health care provider if you have any medical condition which could be affected by exercise. Perform the practices in a playful, exploratory manner. Ask yourself: “What is happening?” and “How do I feel different during and after the practice?” Practice with awareness and passive attention. Remember, Pain, No gain — Pain discourages practice. Pain and the anticipation of pain usually induce bracing which is the opposite of relaxation and letting go. In addition, many of our movements are conditioned and without knowing we hold our breath and tighten our shoulders when we perform an exercise. Explore ways to keep breathing and thereby inhibit the startle/orienting/flight response embedded and conditioned with the movements. For example, continue to breathe and relax instead of holding your breath and tightening your shoulders when you initially look at something or perform a task. Learn to reduce the automatic and unnecessary tightening of muscles not needed for the performance of the task. As you do an exercise, continuously, check your body and explore how to relax muscles that are not needed for the actual exercise. Become your own instructor in the same way that a yoga teacher reminds you to exhale when you are doing an asana (yoga pose). If you are unsure whether you are tightening, initially look another person doing the exercise to observe their bracing and breath holding patterns. Ask them to observe you and give feedback. In many cases, the more others are involved the easier it is to do a practice. It is often helpful to perform the practice in a group. Encourage your whole work unit to take breaks and exercise together. Usually it is much easier to do something together, especially when you are not motivated—use social support to help you do your practices. Is there something for which I am spineless? Who or what is the pain in my neck or back? What is the weight I am carrying? Am I rigid and not willing to be flexible? What negative emotion, such as anger or resentment, needs to resolved? Be willing to act on whatever answers you observe. Back and neck pain is often significantly reduced after emotional conflicts are resolved (see the book by John Sarno, MD., Healing Back Pain: The Mind-Body Connection). The best treatment is prevention, emotional resolution, and physical movement. Allow your back to relax and move episodically. Allow tensions to dissipate and explore the physical, psychological and social burdens you carry. To loosen your neck practice the following exercise. This is a slightly complicated, but very effective process. You may want to ask a friend or co-worker to read the following instructions to you. Pretest: Push away from the keyboard. Sit at the edge of the chair with your knees bent at approximately 90 degrees and your feet flat on the floor about shoulder width apart. Do the movements slowly. Do NOT push yourself if you feel discomfort. Be gentle with yourself. Look to the right and gently turn your head and body as far as you can go to the right. When you have gone as far as you can comfortably, look at the furthest spot on the wall and remember that spot. Gently rotate your head and body back to center. Close your eyes and relax. 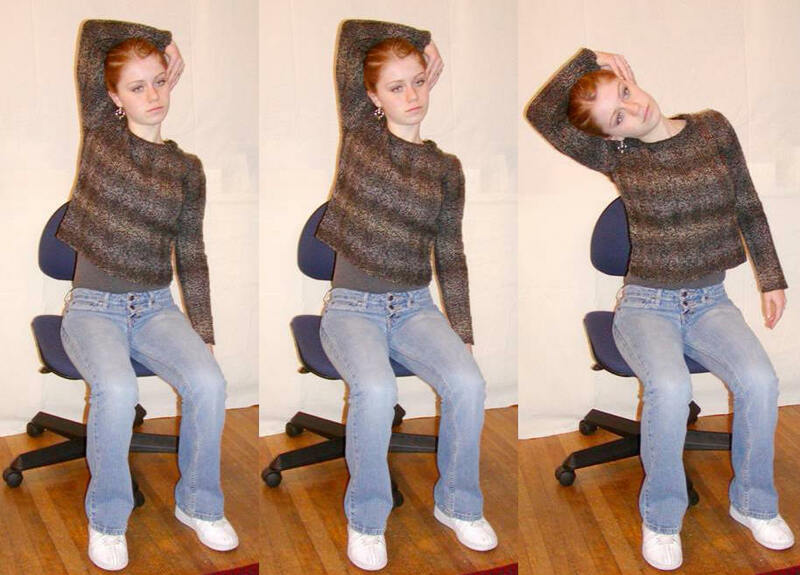 Movement practice: Reach up with your right hand; pass it over the top of your head and hold on to your left ear. Then gently bend to the right lowering the elbow towards the floor. Slowly straighten up. Repeat a few times, feeling as if you are a sapling flexing in the breeze as shown in Figure 1. Figure 1. Illustration of side ways bending with hand holding ear. Observe what your body is doing as it bends and comes back up to center. Notice the movements in your ribs, back and neck. Then drop your arm to your lap and relax. Make sure you continue to breathe diaphragmatically throughout the exercise. Reach up with your left hand, pass it over the top of your head and hold on to your right ear. Repeat as above, this time bending to the right. Reach up with your right hand and pass it over the top of your head, now holding onto your left ear. Then look to the right with your eyes and rotate your head to the right as if you are looking behind you. Return to center and repeat the movement a few times. 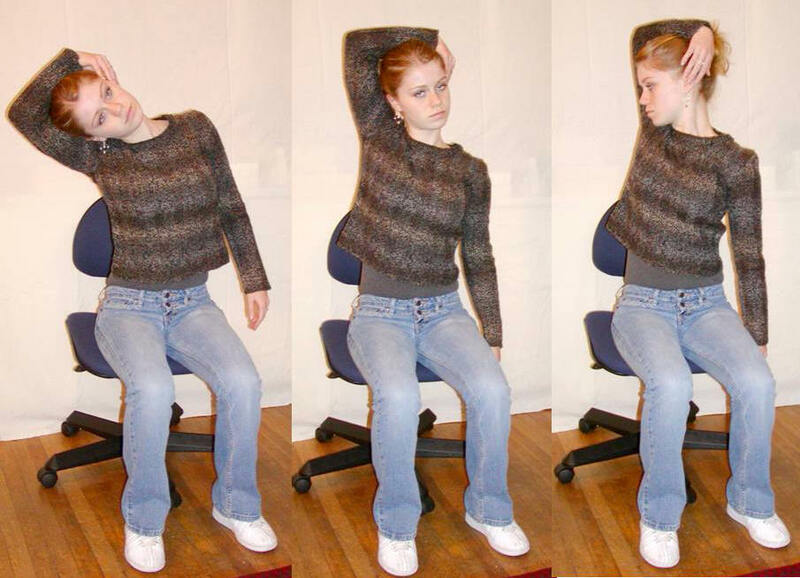 Then drop your arm to your lap and relax for a few breaths as shown in Figure 2. Figure 2. Illustration of rotational movement with hand holding ear. Repeat the same rotating motion of your head to the right, except that now your eyes look to the left. Repeat this a few times, then drop your arm to your lap and relax for a few breaths. Repeat the exercise except reach up with your left hand and pass it over the top of your head, and hold on to your right ear. Then look to the left with your eyes and rotate your head to the left as if you are looking behind you. Return to center and repeat a few times. Then drop your arms to your lap and relax for a few breaths. Repeat the same rotating motion of your head to the left, except that your eyes look to the right. Repeat this a few times, then drop your arm to your lap and relax for a few breaths. Post test: look to the right and gently turn your head and body as far as you can go. When you cannot go any further, look at that point on the wall. Gently rotate your head back to center, close your eyes, relax and notice the relaxing feelings in your neck, shoulders and back. Did you rotate further than at the beginning of the exercise? More than 95% of participants report rotating significantly further as compared to the pretest. For additional exercises on how to loosen your neck, shoulders, back, arms, hands, and legs, click on the link for the article, Improve health with movement: There is life after five or look at the somatic relaxation practices in part 3 of our book, Fighting Cancer-A Nontoxic Approach to Treatment. As usual Erik, you are a groundbreaker and dedicated professional – Which we from NJ quickly and ongoing learned at our memorable Stress Management Seminar with you in the Caymans! So again thanks for sharing these great non-invasive and empowering techniques! Not only I benefit from whatever you share with us but also I share them with my colleagues in Turkey… Thank you for your nonpossesive attitude:) It is a great virtue for the field. Thanks for this great post. Though I studied with you many years ago, I’m very grateful to be learning from you still.